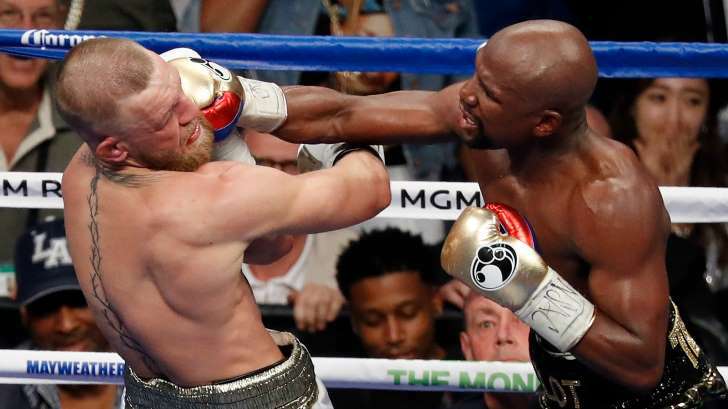 Conor McGregor was taking a beating and basically on his way to being dropped - if not knocked out cold - by Floyd Mayweather last month. If not for referee Robert Byrd stepping in to save McGregor early in the 10th round, chances are the UFC lightweight champion was going to hit the canvas. Mayweather (50-0 boxing) is happy it didn't come to that and explained why he didn't inflict more damage on McGregor (21-3 MMA, 9-1 UFC, 0-1 boxing) in a recent episode of the "Hollywood Unblocked" podcast. "He has a career. You know, he still has a career. He's still young," Mayweather said. … (It could've been) very damaging. We have to think about these fighters. Even, like, my uncle Roger. Right now, I just got a call just before I came here. He keeps walking off, wandering off. No one can find him. He ends up in a hospital. So, brain damage - it happens. It happens." That's either intriguing, thoughtful insight into the mindset of a prize fighter while he batters his opponent, or it's just a humblebrag. Why could it be the latter? Because moments later, as the host mentioned he was surprised McGregor "did better than what I thought he was going to do," Mayweather interrupted to respond - and also confirm that he barely trained for the fight. "OK, hold on. It's a catch 22," Mayweather said. "If I blew him out in the first round, they would have something to say. If we let the fight go on a little longer than expect, they're going to have something to say. So it's like, damned if I do, damned if I don't. If I let it go the distance, they're going to say something. "Once again, we're praising him. We're not praising me. We're praising him. Because I'm 40 years old, retired for two years. He's 28, he's active. I'm inactive. He's taller, he's bigger. Hey may not be stronger. He has a longer reach. He's taller. He's bigger. He's younger. Youth is on his side. I'm just saying, everything on paper links on him. For me to come and be off, and really only train totally, probably three weeks .. and (I was) out every night partying." See what I mean? Whatever the case, the fight played out pretty much as expected, and everyone should be pleased with the outcome.